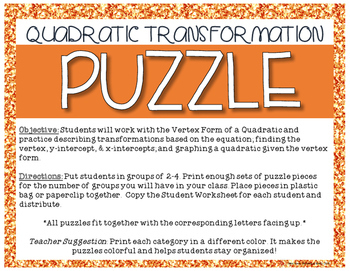 In this activity, groups of 2-4 students will receive 32 puzzle pieces that will have a representation of a quadratic function. 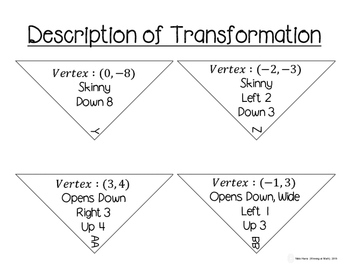 Each puzzle will have a Vertex Form Equation, Vertex & Transformation Description, Intercepts, and a graph. Students fit 4 pieces that match and make a square. 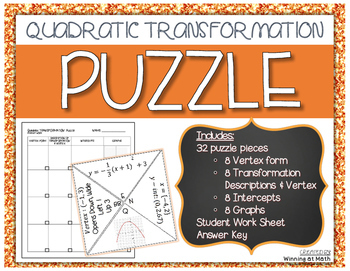 When completed, each group of students will make 8 puzzles, each with 4 pieces. 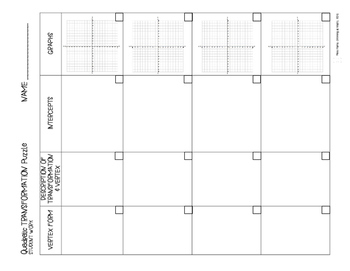 This is great for a review activity or to spiral back to an old concept!